Transform Your Body. Transform Your Business! Everybody’s favorite business-building tool is back with new training designed to take your business to the next level – no matter where your business is today! Move step by step to get clear on your vision, learn the strategies and skills to help you fulfill that vision, and plan your next 90 days to achieve your goals. Download your 2018 90-Day Action Plan from IsagenixBusiness.com. The new IsaProduct.com is your home for anything to do with Isagenix products. As a consistent product user, you can peruse the endless trove of information and build your own product knowledge to pick up countless tips for success. Direct prospective new Customers to IsaProduct.com if they are curious about starting their Isagenix journey. There, they can dive in and research all their questions. Business builders, rest assured! With a massive catalog of dozens of products to offer, IsaProduct.com is the go-to resource for answers to all those tough questions 24/7. Start sharing the new IsaProduct.com today. This new Weight Loss Value Pak now contains our most popular 30-Day Cleansing and Fat Burning System along with one canister of Isagenix Greens™, one box of Whey Thins™, the new IsaBlender® Max, a US$25 product coupon, and two Friends and Family one-year free membership activation codes! Plus, this new Weight Loss Value Pak’s Product Introduction Bonus has been increased from US$80 to US$100! What a win-win! 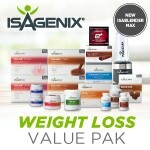 Get all the details on the updated Weight Loss Value Pak at IsaFYI.com. Inspire new Members to get started by sharing the success of professional athletes who use and love our products. LPGA and Olympic professional golfer Anna Nordqvist shares her story in this incredible video. Send this video to others from IsagenixBusiness.com. Share Lisa’s incredible story of how she started with Isagenix and built her business from the ground up! You can find this video at IsagenixBusiness.com. Stay organized and focused with your new 2018 Isagenix planner! Upgraded from last year’s biggest hit, this new planner has a helpful Week at a Glance layout. Recognize your progress with weekly and monthly Goal Setting and Reflection pages and an Income-Producing Activities tracker! 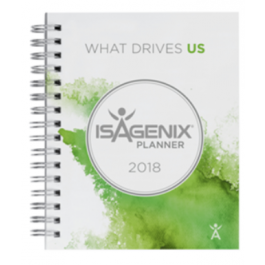 Purchase your 2018 Isagenix Planner at IsaSalesTools.com. The IsaBody™ Look Book is everybody’s must-have tool to showcase real results from real Isagenix Members. Share dozens of “before” and “after” photos of everyday transformations and the latest IsaBody Challenge® winners! Purchase your 2018 IsaBody Look Book at IsaSalesTools.com. Get your new Customers started with the streamlined New Member Form! Have a pack with you to simply walk your friends and family through the first-time order process so they are sure to receive the right products for their needs. This new form now includes updated paks and products! Purchase your updated New Member Forms at IsaSalesTools.com, or download it at IsagenixBusiness.com. NEW! Business Card Designs – SPECIAL! 250 Cards for US$20! Pass along your contact information professionally and compliantly with Isagenix business cards now available in eye-catching new designs! Order at IsaSalesTools.com using the promo code ISABIZCARD, and receive 250 cards for US$20. Be the center of attention with a fresh pop-up banner for your events! Order at IsaSalesTools.com, and use promo code BANNER2018 to receive yours for just US$99! Help new Customers get started in January to earn an additional bonus on top of your commissions and other bonuses! You could earn up to an additional US$1,000/CA$1,110 bonus, and if leveraged with the Weight Loss Value Pak, and other promotions, you can earn up to US$3,900/CA$3,824 in January alone! * Visit the January Jolt page to see how. Eligible** past Customers are able to rejoin Isagenix with a free one-year Autoship membership (US$29 value) and free ground shipping*** on their first order (up to US$25 value) while maintaining their Isagenix Placement Tree position when they order at least 1 BV in product. That’s it! Identify qualified people by visiting your Back Office and looking for the “Eligible” icon on your “Personally Enrolled” report! For tips on how to reconnect, check out the Welcome Back promotion page. Get paid sooner on select PIBs! Earn Daily Pay bonuses when you help new Customers get started with a select pak. Learn how to earn Daily Pay. Leadership Pools offer you extra opportunities to earn shares in a massive bonus pool for building your business. Learn about the Director Leadership Pool, Executive Leadership Pool, and the Platinum Leadership Pool now! Build your team and receive free Complete Essentials™ With IsaGenesis®. Here’s how with the Team Builders Club. Updated 2018 Promotion Flyers Coming Soon! *The January Jolt promotion is open to all U.S./CA/PR Associates. No registration is necessary. Isagenix reserves the right to audit, adjust, or deny any volume, compensation, recognition, or other incentives awarded during or as a result of this promotion to ensure the spirit of the promotion is achieved. Qualifications are subject to change by Isagenix at any time without prior notice. **A former Personally Sponsored Member whose Isagenix membership has expired, but was not terminated by Isagenix, and has not placed an order in the past 90 days or more is eligible to re-enroll through the Welcome Back promotion. In order to receive the incentives, the former Member MUST re-enroll with his/her most recent Enrolling Sponsor. (If you have a former Personally Sponsored Member who re-enrolled with another Associate, in accordance with applicable policies and timelines, that Member is not considered eligible for you.) Incentives are nontransferable and may be used only once. The former Member must also reside in the U.S., Canada, Puerto Rico, Australia, or New Zealand. This promotion ends March 4, 2018. ***Free Isagenix ground shipping (up to US$25/CA$27.77/AU/NZ$14.95 value) is automatically applied to the initial qualifying order.